Covers the western region (Ely area access) of this popular paddling wilderness This guide gives day-by-day routing through the lakes, rivers and portages, points of interest. With thousands of lakes and streams, over 1200 miles of canoe routes, 160 miles of portage trails, and 2000 campsites, the Boundary Waters Canoe Area Wilderness is a true paddler’s paradise. Extending nearly 150 miles in northern Minnesota along the Canadian border, the wilderness area encompasses more than 1 million acres. This Western Region edition classic of two-volume guide has been fully updated by area journalists Robert Beymer and Louis Dzierzak, with full coverage of 50-plus entry points and routes. Trip descriptions include day-by-day paddling distances, portage tips, and difficulty ratings, and identify the appropriate water-resistant, topographic maps W.A. Fisher maps for each trip. Together, these books deliver everything a visitor needs for the experience of a lifetime. 7th edition. 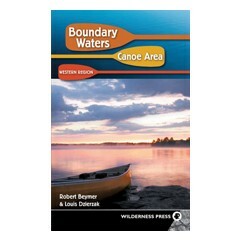 Companion volume to Boundary Waters Canoe Area: Eastern Region.